Haute-Saône (French pronunciation: ​[ot.soːn]; Arpitan: Hiôta-Sona) is a French department of the Bourgogne-Franche-Comté region named after the Saône River. 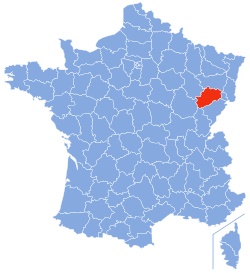 Haute-Saône is divided into 2 arrondissements and 17 cantons. 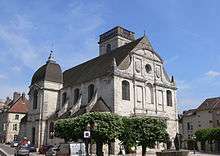 The department was created in the early years of the French Revolution through the application of a law dated 22 December 1789, from part of the former province of Franche-Comté. The frontiers of the new department corresponded approximately to those of the old Bailiwick of Amont. 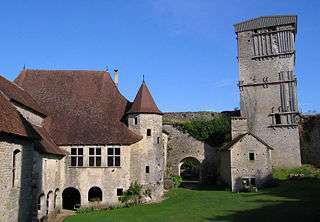 Haute-Saône is part of the Bourgogne-Franche-Comté region. Neighbouring departments are Côte-d'Or to the west, Haute-Marne to the north-west, Vosges to the north, Territoire de Belfort to the east, Doubs to the south and east and Jura to south. The department can be presented as a transitional territory positioned between several of the more depressed departments of eastern France and the so-called Blue Banana zone characterised, in recent decades by relatively powerful economic growth. 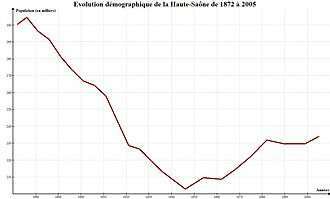 Population Changes between 1872 and 2005 (source:INSEE). The baseline on this graph is set at 200,000 people, and the increments represented by the horizontal grid lines are of 10,000. 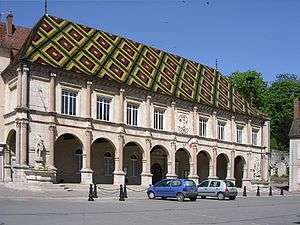 In common with many rural departments in France, Haute-Saône has experienced a savage reduction in population, from nearly 350,000 in the middle of the nineteenth century to barely 200,000 on the eve of the Second World War, as people migrated to newly industrialising population centres, often outside Metropolitan France. During the second half of the twentieth century the mass mobility conferred by the surge in automobile ownership permitted some recovery of the population figure to approximately 234,000 in 2004. The rural nature of the department is highlighted by the absence of large towns and cities. Even the department's capital, Vesoul, still had a population below 20,000 in 2010.